Does Paris Have a Smoking Ban? It's actually more complicated than that and has more to do with failed, or overly lax or vague, measures put forward in the past. Well aware since the 1970s that smoking was a public health concern, France has passed many anti-smoking measures over the years-- the earliest dates to 1976--but until very recently, they all fell short of banning "les cigarettes" in all public areas, or even badly enforced restrictions in places where they were supposed to be banned. So in 2006, when the French government announced that they would be banning smoking from all public places in France, including cafes, restaurants, and most bars, many people (myself included), skeptically wrote the proposed measure off as another futile attempt to change a fundamentally cigarette-happy culture. Well, we were all wrong, as it turns out. Since the ban took effect, the city's once hazy cafes and restaurants have become surprisingly breathable, and most locals quickly adapted to the new laws, obligatory grumbling aside. Most Parisians have adjusted to the change with an ease that has taken everyone by surprise, especially considering the longstanding cultural tradition here of protesting and flouting the rules whenever possible. It was a swift change of culture, and it stuck. It worked! Mon dieu! Sure, some people have lamented the death of an iconic Parisian cafe scene, exemplified by existentialist French philosopher and playwright Jean-Paul Sartre, who was rarely ever spotted without a cigarette. The success of the smoking ban is an example of how popular cultural stereotypes on the French and Parisians are not as solid as some would believe. The Ban in Detail: What Places Does It Cover? One confusing and slightly annoying point (for non-smokers)? Many cafes and restaurants with outdoor, partially enclosed and heated terraces do allow smoking-- meaning that if you do want to sit outside on a nice, warm evening, or cozy up next to a brazier outside during the winter, you'll have to be prepared for some pretty heavy fumes. These terraces are now often dominated by smokers who frequently prefer to be able to light up during their meal, without having to leave the table. 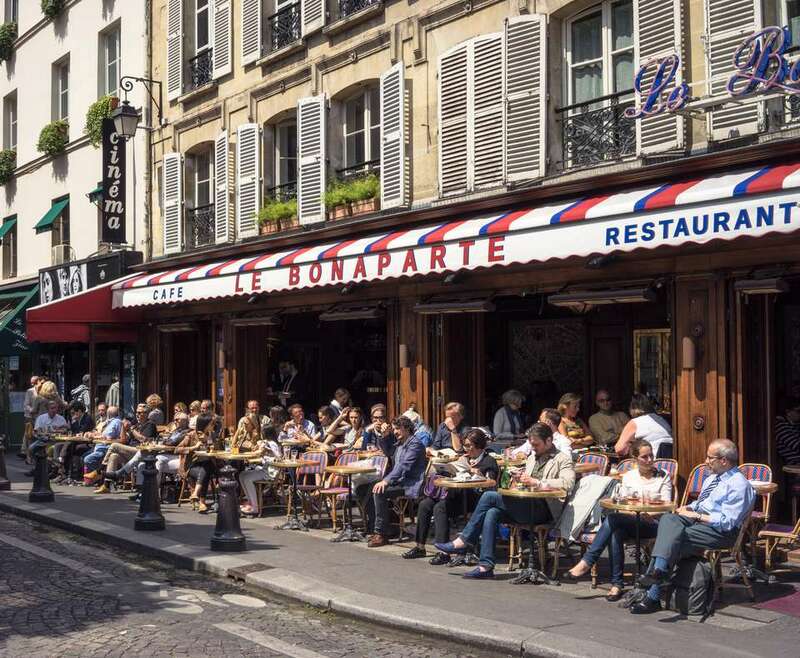 Another issue that has gotten under the skin of some, especially in Paris, is that sidewalks outside bars and clubs are often crowded with smokers, blocking foot traffic and generating extra noise. Paris' solution? Creating anti-noise legislation that has rankled...you guess it...smokers, among others! The (un)virtuous circle of complaining never seems to end in France. Part of the charm? You decide. Maybe you're a smoker who's annoyed that you can no longer enjoy a cigarette in most places in France, where you had been fantasizing about looking like Jean-Paul Belmondo or Jean Seberg in Godard's film "Breathless", lingering for hours in some smoky bar in the capital. It's indisputable, though, that this legislation has led to some concrete improvements in the overall health of the country and its inhabitants. According to the French Ministry of Health, only a year after the ban took effect across the country, the number of people under age 65 admitted to emergency rooms for heart attacks dropped by 15%. Airborne pollution and toxins in most public establishments dropped 80% in the first three months. Sure, some might still be grumbling a bit-- it's a Parisian tradition, especially. But for most people, the smoking ban has been a good and surprisingly enduring change.